I’m thrilled to be speaking at a very unique online event in November as one of 30 thought leaders. 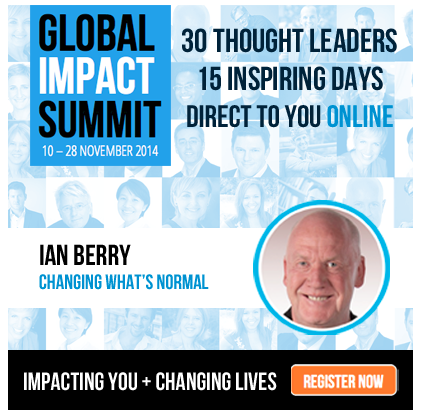 It’s called the Global Impact Summit and it gets underway on the 10th of November and is LIVE online for 15 days. All the Summit delivers is impact. And ONLY Impact. No selling of stuff. Just impact, pure and simple. • 360 days of education support were provided to children in Botswana. • 58,400 days of access to life-saving water were given to people in Ethiopia. • 68 coaching sessions were given to Social Entrepreneurs in India. • 240 children received improved learning environment for a year. Please click here to find out more, to register, and make your own impact. Even if you can’t get to every one of the sessions live, register now. They are being recorded so you can watch the replays. It’s a wealth of inspirational business insights for you to keep!